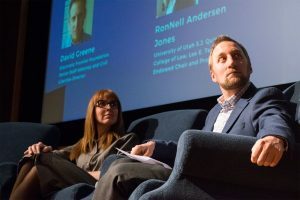 In light of recent trends and public opinion shifts on press and its role as a news source, Media Law Professor Patrick File decided to bring two law experts, David Greene, Senior Staff Attorney and Civil Liberties Director at Electronic Frontier Foundation, and RonNell Anderson Jones, professor of law at University of Utah S.J. Quinney College of Law, to discuss threats to the First Amendment and freedom of the press in the current political climate. 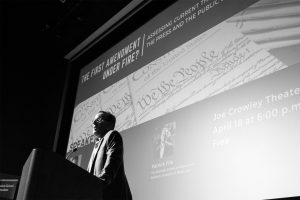 “I think it’s always important for people who care about democracy to consider the role of the First Amendment, free speech and the press, but it’s a particularly crucial time to do so right now,” File said. 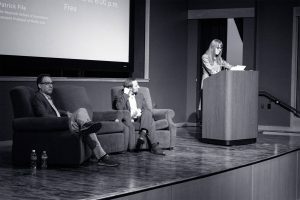 “The event was inspired by the discussions about free speech we see happening all around us in the press and the public sphere—in the streets and on social media. File began by speaking on the the rise of “fake news” and the presidential administration’s active disdain for the press. Both guests gave a short talk followed by a moderated Q&A with the audience. 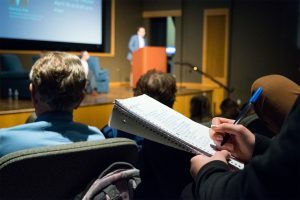 Jones began her talk by highlighting historically administrations’ attitudes towards press, namely how the current trends of the presidential administration differ largely from administrations in the past. Some of the “journalistic rights” the press has expected have never been exactly identified in law, she said. People who care about civil liberties should care about freedom of speech rights, and that includes the press, she argues. 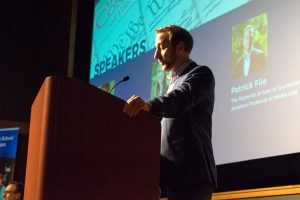 Greene discussed the legality and infringement of freedom of electronic surveillance, especially when journalists are covering protests or public demonstrations. He said he’s skeptical that the current administration would pass a federal shield law that would protect journalists from having to disclose the identities of their sources. Greene also warned about “press verification” via the government. 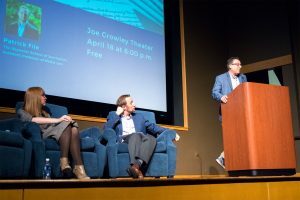 In answering people’s questions, both Greene and Jones advocated for healthy skepticism and more media literacy education. Other topics included financially supporting news outlets and diversifying news feeds by following outlets that don’t necessarily line up with your beliefs. File said he’s pleased with how the event went. 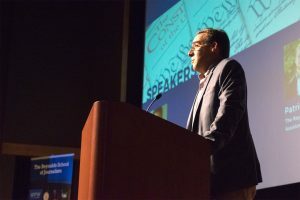 “It was a great turnout, and inspiring to see how much people across the University and local community care about the First Amendment and are eager to engage in a timely discussion about the health of democracy,” he said. 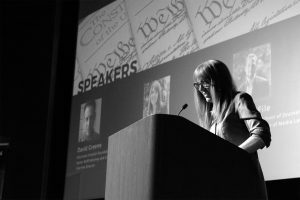 Both experts detailed specific threats to the first amendment unique to our current era – but they also had ideas for combating the trend. Concerned community members can call their representatives and express their support for good journalism. People can subscribe to legitimate media sources (local and national) and support nonprofit journalism. Greene and Jones both stressed the need for increased media literacy and mindful media diets. Things are grim, but there are things we can do. 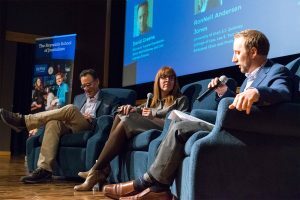 Did you miss this Reynolds School event? Don’t miss the next one.